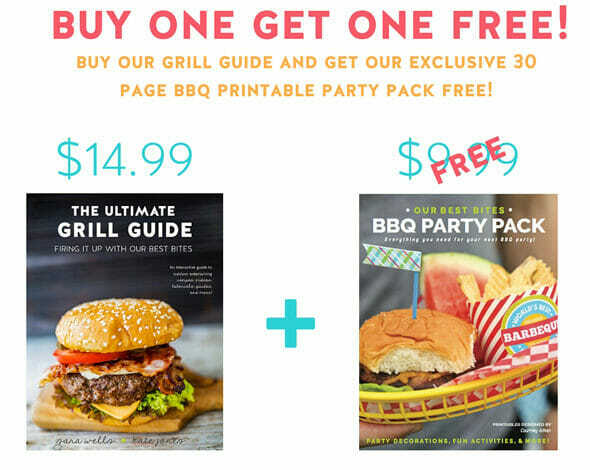 New Book: Ultimate Grill Guide + Party Pack Bonus! First of all, we are very excited to be starting a regular (and very awesome) weekly newsletter. Some of you have been receiving just our blog posts to your inbox for years, but this is different. In addition to our new blog posts for the week (all wrapped up in one handy email) in this weekly email you’ll get exclusive recipe content, new features, discounts, behind the scenes info from both Kate and me and more! It’s going to be awesome and you don’t want to miss it! After signing up we’ll be sending weekly newsletters (no junk, promise!) but as a thank you gift, you’ll get a brand new newsletter-exclusive recipe every day for a week (starting immediately)! These are family friendly dinner recipes that aren’t available anywhere but in the newsletter. And they are GOOD. After the 7 days you’ll just receive our normal weekly newsletter. Now for what you’ve all been waiting for…. our new eBook! Let me show you exactly what you get with our amazing new Grill Bundle! We’ve worked so hard on this (like, it was supposed to launch in May but we kept wanting to add more and more content and it turned into a HUGE thing) and we know you’ll love it! 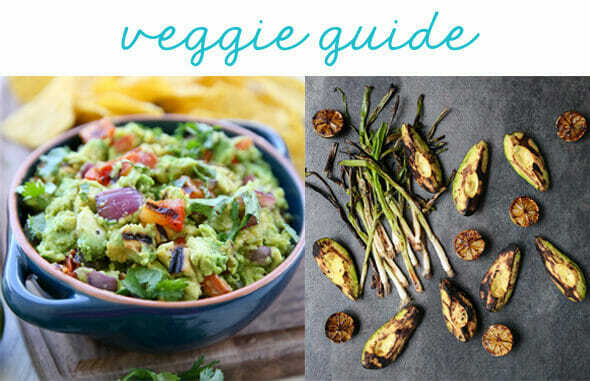 This is not just an ordinary cook book, it’s a nearly 100 page full-feature guide with tons of recipes, information, tutorials, video links, and more. AND we have an amaaaazing (and enormous) Printable Party Pack as well. EXCLUSIVE RECIPES: To-die-for recipes for creative and unique spreads, delicious entrees, gourmet burgers, grilled sides, and tons more. HOW-TO’s: Ever wondered how to deliciously grill asparagus? Avocado? Sweet potatoes? We have great and easy-to-understand how-to’s on everything from A-Z! VIDEOS: If you’re a visual learners like we are, we’ve got you covered. 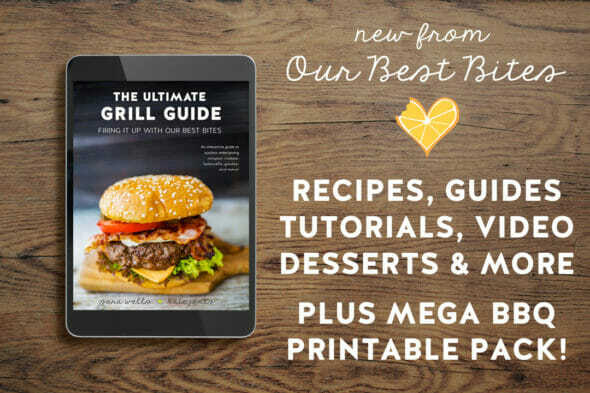 We’ve included 4 instructional videos (or video links depending on what format you have) in The Ultimate Grill Guide so we can teach you in your very own kitchen any time! MUST-HAVE PARTY PRINTABLES: Throwing a great backyard bash is a breeze with our gorgeous party pack printables! This professionally designed 30 PAGE printable PDF includes darling invites, games, food labels, place-mats, photo booth props, and tons tons more! Here’s a sneak peek of the book content! 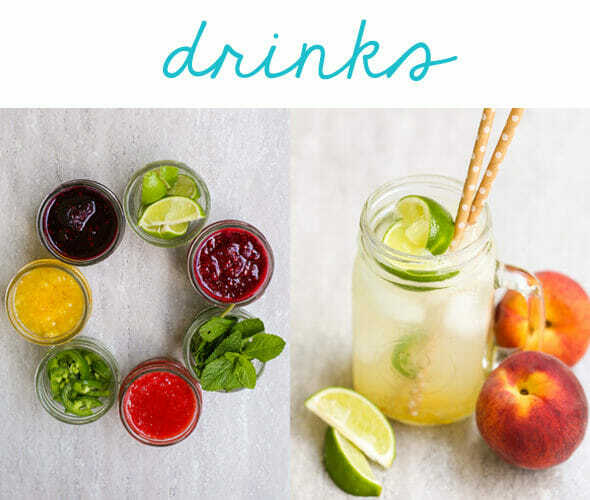 Our drink section contains master recipes and then tons of add-ins and ways to mix them up for endless combinations. You are going to step-up your burger game BIG TIME. You can make those restaurant quality gourmet burgers right at home with our guide of master recipes and nine different sauces. 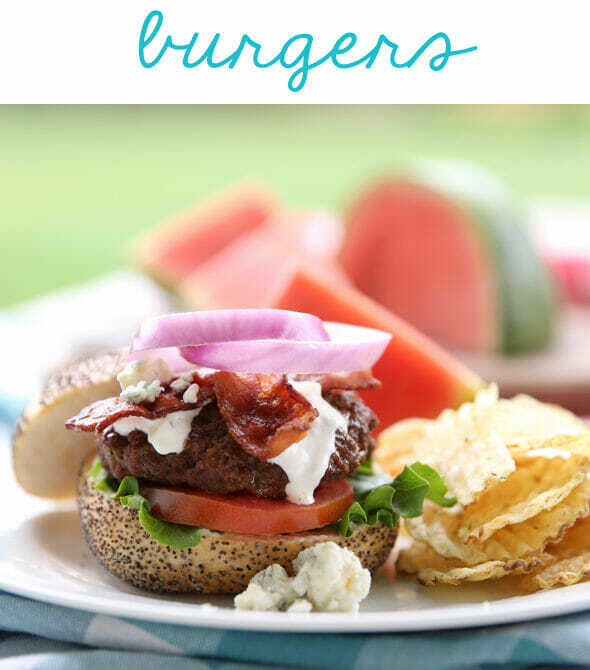 We give you tons of ideas on how to mix them up to create specialty burgers. We get so many questions about what cuts of meat to buy for different recipes. We have some amazing interactive resource guides that cover every last cut of beef, pork, and poultry and all the different ways you can (and should) cook each one. We’ve also included our very popular tutorial (and a video!) 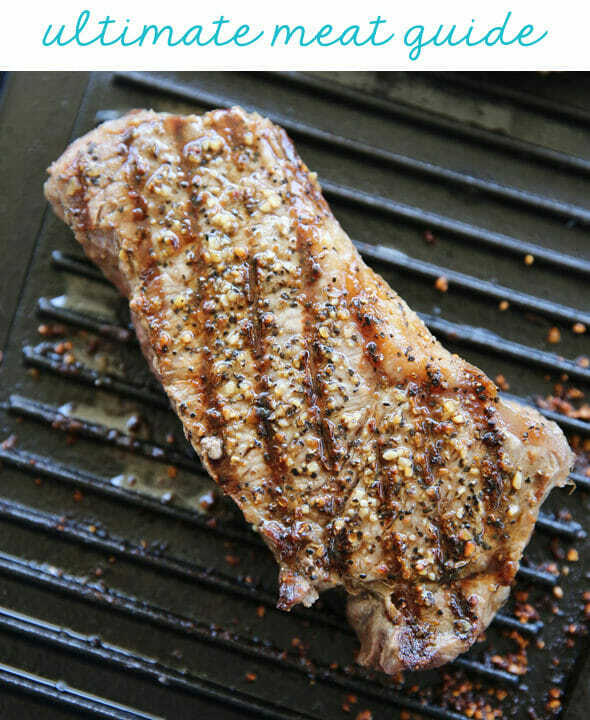 about how to cook the perfect steak. 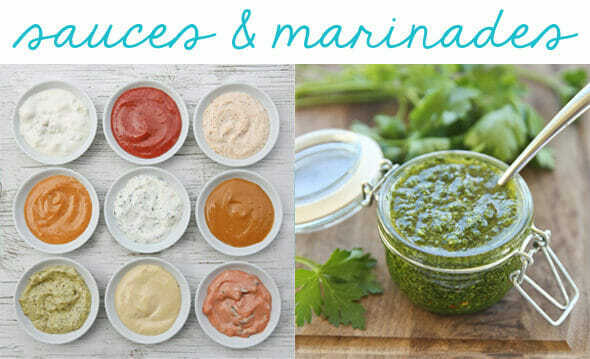 We’ve got all of our favorite sauces and marinades right in one place, plus great ways to use them. We’ll show you how to grill really unique things you may not have thought to grill before. Honestly, the price of the book is worth it for this Smokey Grilled Guacamole alone. For real. This is really just a small sampling of what’s included. And in addition to ALL that, we also have this awesome BBQ Printable Pack. Guys, this is so fun! These pictures below are only a teeny tiny part of it. We’re talking 30 pages of labels, flags, custom art, huge game posters (that only cost about $3 to print at your local copy store), party favors, wraps, placemats…the list goes on and on. This is all exclusive to Our Best Bites; designed by the talented Courtney Aitken, you won’t find it anywhere else! I can’t even tell you how awesome this is. I threw a BBQ party and got SO many compliments on all of this fun stuff. 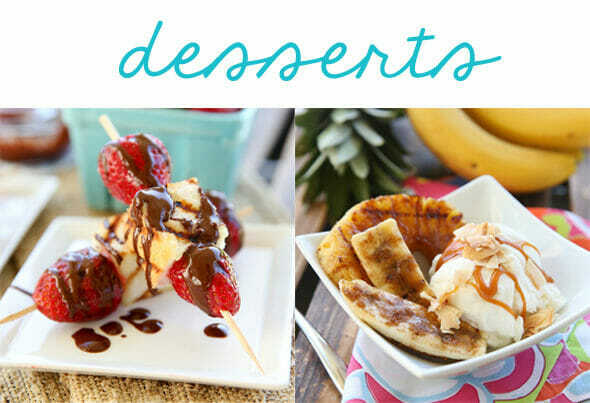 You will be the hostess-with-the-mostest for sure! That’s right- when you sign up for our newsletter, you’ll have the option of purchasing our new book and when you do, you’ll get this Party Pack for FREE! Our book (without the printable pack) will also be available in the iTunes store very soon if you’d rather purchase that way, but this bundle is only available via the newsletter sign-up. Easy peasy! So don’t waste time- this is a ONE TIME deal, just click below to get started! Once you enter your email for your 7 days of recipes, you’ll be able to get the Grill Guide and Party Pack! I’d love the grill guide but only in a printed version. If you ever do that, let me know. I’ll buy the first one! There are a few versions available once you buy it, including a simple PDF that is printer friendly (you’ll want to print it landscape — the book is horizontal). You could select the specific recipes you want to print out so you aren’t printing the whole thing. Is the grill version available in print? I’d love it, but don’t have a home computer or tablet ( I just use Internet on my phone) so a printed version would be amazing!! This whole post makes my mouth water!!! I’ve got my guide and can’t wait to start using it! Love it so much! I just keep scrolling through all the recipes, can’t wait to start grilling! I’ve purchased the new e-book and it’s very exciting! Is there a way to find a specific recipe after you’ve downloaded it or do you have to always scroll through the whole thing to get to the section you are looking for? It depends on what device you are using. The table of contents should be clickable – have you tried that? 🙂 Glad you like it! Maybe I’m slow, but I can’t figure out how to sign up for the newsletter? Help! At the end of this blog post there is a big graphic that says “click here”, just click there! Will this ever be available in a print version? I would buy it in a second if it is! As of right now, no plans for that! I’ve been trying to purchase the book all morning but when I enter my payment information and hit the button to submit it brings me back to the same page to enter my information again. Any suggestions? That’s so strange! If you’re on a computer, maybe try a different browser. Otherwise shoot an email to Catharine@ourbestbites.com and she’ll take care of ya! I tried a different browser and it worked. Thanks so much! 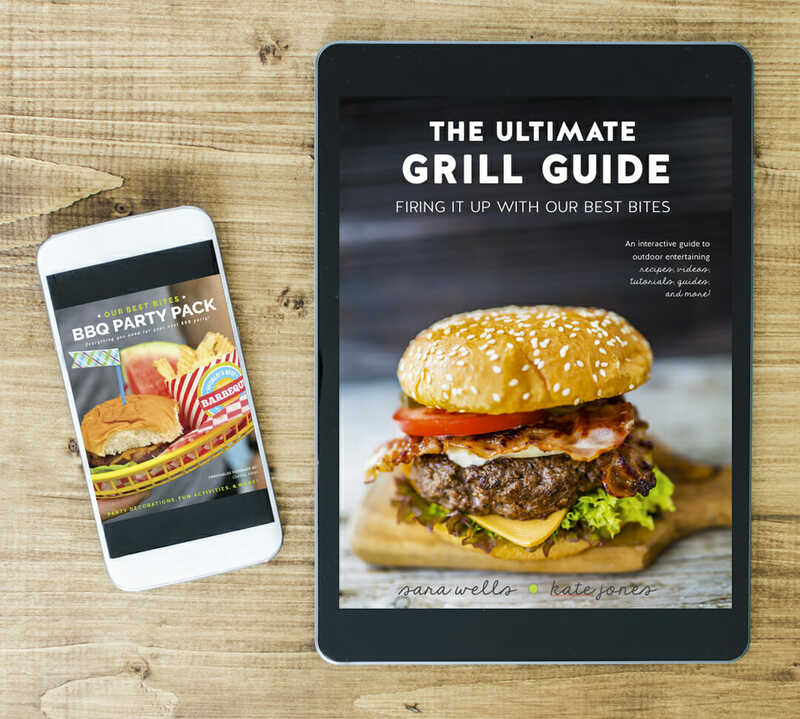 Hi, just bought your grill book, now I need the code for iPad? I love and have all three of your cookbooks. I so enjoy the creativity and flare that each one brings. Can’t get enough!! I just saw this, is it to late to get this bonus pack?